I realize that a post about rice pudding might seem a bit pedestrian, but it was that kind of Sunday - gray, lazy, and quiet. I sat and read on the couch and heard barely a rumble from the outside world for hours. It was a day of simple foods - green tea and toast for breakfast, cold green beans and pasta for lunch. 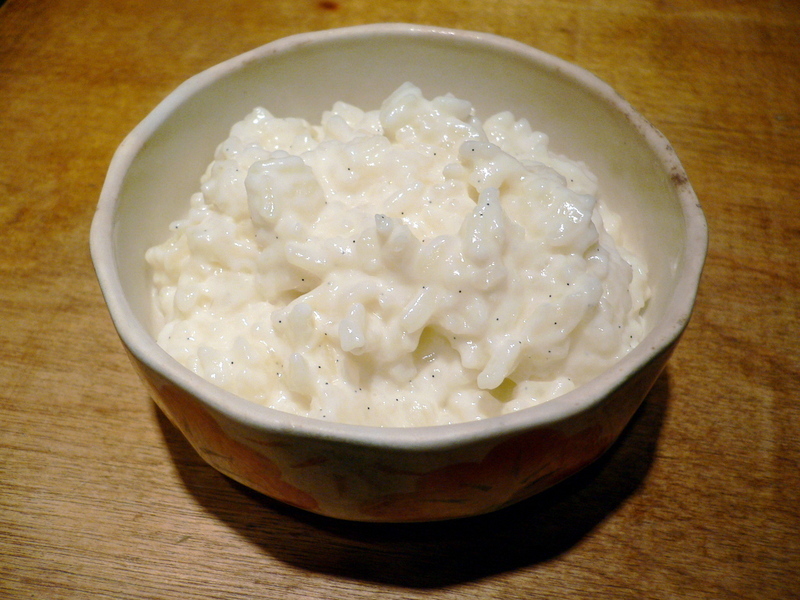 There could be, then, no better afternoon snack than a bowlful of barely warm, just-cooked rice pudding. The last time I tried to make rice pudding, I ended up with rice soup (that's what happens when you try to make pudding with anything but whole milk). This time, I was determined that wouldn't happen to me. Armed with a gallon of whole milk, a sack of Carolina rice, half a vanilla bean (times are tough, people, and I'm cutting corners where I can), some sugar, and the dark horse of the day, a bay leaf, I busied myself at the stove. I'd had the recipe, clipped from an article about Mexican vanilla by Florence Fabricant, for almost three years. The recipe came from Christian Delouvrier's book, Mastering Simplicity, and, with the mention of that bay leaf, had lodged itself in my head as something that simply had to be tried. Bay leaves, at least in my corner of the universe, only ever show up in soups and sauces. Sure, some people have you stick them on gleaming fillets of fish, or tuck them into a braise of meat. But in dessert? Never. And doesn't it sound intriguing, now that you've thought about it for more than a split second? I brought rice, water, and the bay leaf to a boil, then drained the rice immediately. This step still perplexes me, but I'm sure it served some purpose. The rice, the bay leaf, most of the milk, half the sugar and a good pinch of salt went into a second saucepan, along with the split vanilla bean. (Remember, I only used half a bean because I'm feeling pinched. But after tasting the results, I actually think half is plenty. No need to go whole bean here.) Over very low heat, the mixture slowly, slowly cooked together - each grain growing plumper, the vanilla-specked milk thickening and turning a rich, pale yellow. When all the milk had been absorbed, I added another cup and let that cook down for a quarter of an hour before turning off the heat. The pudding was incredibly lush, like a risotto cooked with cream. The familiar scent of vanilla and cooked milk rose up from the pot, but it mingled with a faint, floral fragrance that I barely recognized - the bay leaf! I plucked out the bay leaf (I was feeling wary - bay can get so strong) and let the pudding cool before dolloping a luxuriant spoonful of it into a bowl. The pudding was delicious - the rice still had an agreeable chew to it, despite being swollen with milk and sugar. The vanilla and bay combined to give the pudding an air of sophistication, but just barely. After all, rice pudding doesn't need too much gussying up. I didn't continue with Delouvrier's caramel sauce, though I imagine that step would turn the pudding into something worthy of a dinner party. Though these accompaniments might be even more dazzling. For me, this rice pudding was an afternoon snack of the best kind - wholesome, nutritious, gently perfumed with the scent of my grandfather's laurels, and most definitely a good cure for any kind of Sunday blues. 1. Place rice in a small saucepan with bay leaf and 2 cups water, bring to a boil over high heat, then drain immediately. Transfer rice and bay leaf to a heavy 3-quart saucepan. 2. Add 4 cups milk, 1/2 cup sugar, vanilla bean and salt. Place over very low heat and cook, stirring occasionally, until milk has been absorbed by rice, about 1 hour. Add 1 or 2 more cups milk, and continue cooking over low heat 15 to 20 minutes longer. Rice should be tender and mixture should be very creamy. Remove from heat, and allow to cool to room temperature. 3. Combine remaining sugar with 2 tablespoons water in a 1-quart saucepan. Place over medium-high heat, and stir gently until sugar dissolves. Continue cooking until mixture turns a medium amber color. Remove pan from stove and place on a heat-proof surface to cool. Caramel will darken somewhat and harden as it cools. 4. No more than 30 minutes before serving, add a little milk to rice if it has become too thick, then remove bay leaf and vanilla and transfer pudding to a shallow serving bowl. Add 2 tablespoons water to caramel, return it to stove and place over medium heat. Cook about 5 minutes until caramel has softened. Stir to incorporate water. Remove from heat. To serve, drizzle caramel sauce over pudding.